Renga is an ancient Japanese poetic form that is unique in being written collectively, by a group. Each member of the group contributes verses and discusses the poem as it grows, link by link. Each verse alternates 3-lines and 2-lines, moving through seasons and subjects according to a pattern — the schema. No experience of writing in this form is necessary — the poem is itself an absorbing and enjoyable learning process for all participants. 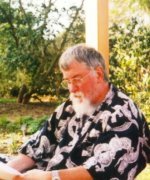 Colin Will has had four poetry collections published, the latest being Sushi & Chips (2006). He chairs the StAnza Festival; is webmaster for Poetry Scotland and is Poet Partner to Moray. He lives in Dunbar, and he has travelled widely — in Europe, America, Japan, China and Tibet — his poetry reflecting his travels and his background. He is an experienced renga master, and also writes and teaches other Japanese forms — haiku, haibun, tanka and others.